•Comes with a Remote Control, the LCD projector is designed with simple manual buttons, easy to set up and use. •Xpismii projector uses the healthy diffuse reflection technology, not the direct light source like other basic projector. Your eyes will not feel fatigue even watching for a long time. •Equipped with double tube cooling system and upgraded design fan, the fan sound has been reduced in half, which will offer you a quiet environment during watching movies or football matchs. •Adopted the latest smart LED lamp care technology, extending the lamp life to an impressive 30000+ hours; Even if you watch a two-hour movie every day, your projector's LED lamp should last many years. •A Wireless HDMI Dongle (not included) is required if you want to connect the projector to smartphones (which support MHL) and tablets. 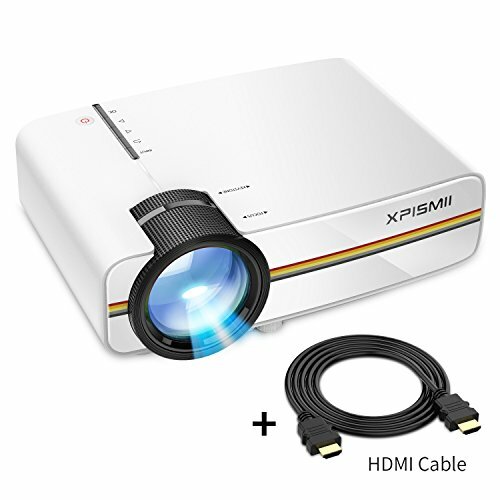 •Please adjust the PC/laptop display resolution to 800*600 or 1024*768 when you connect the mini video projector to PCs or laptops for the best clarity. •The LED projector doesn't support Dolby Audio System. If there's no sound, please turn off Dolby Digital when you connect your device with a HDMI cable.